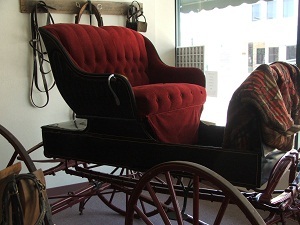 The Transportation Museum is located in Monte Vista, just to the east of the historic Fassett Building, at 916 First Avenue. The admission is by donation. The hours of the Museum are Tuesday through Saturday, 12:30 p.m. - 3 p.m. 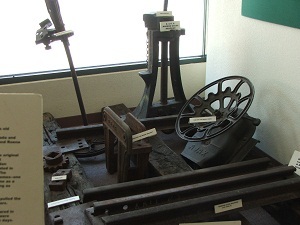 The Transportation Museum and the Monte Vista Historical Society have combined their efforts into one building to give a more complete overview of the town. The early history of Monte Vista goes back to 1881 when the Denver & Rio Grande Railway placed a railroad at a site called Lariat near the present day Fullenwider Park. A land promoter chose Monte Vista as a site to promote new canal ventures, resulting in a new town called Henry incorporated in 1884. In 1886, the town site was re-platted and was then name Monte Vista for the mountain vistas surrounding it. The Museum had a very informative display on the history of water in the San Luis Valley. Since the San Luis Valley depends so much on precious water for its large agricultural means, ways to retain water are vital. There are pictures and information about the reservoirs which store water for agricultural usage. These reservoirs include the Continental, Terrace, Mountain Home and Smith, and Rio Grande. The pictures of the building of these reservoirs are just incredible. 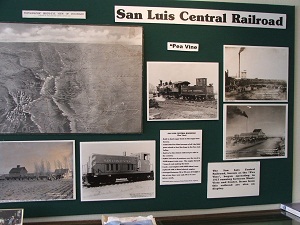 There is a display at the Museum which talks about the San Luis Central Railroad, also known as the Pea Vine. This railroad was built to haul sugar beets to the sugar beet factory in Monte Vista in 1913. The Pea Vine is still an active railroad which runs between Monte Vista and Center. It acquired its name because of all the field peas raised in the San Luis Valley to feed hogs. It is the richest railroad per mile in the country. Sugar beets were such a large crop in the San Luis Valley at one time. There is a black and white picture of the opening day at the San Luis Valley Sugar Beet Factory on November 15, 1911. It was very interesting to see the wagons loaded with sugar beets coming to the factory. The Monte Vista Historical Society has an amazing collection of over 1,500 black and white photographs of Monte Vista as well as other areas in the San Luis Valley. Take time to look through their many books of photographs to get a real grasp on the early settlements of the Valley. Of particular interest are the photograph books of O.T. Davis who traveled the San Luis Valley taking pictures in the early 1900’s. While at the Museum, I highly recommend that you pick up a Monte Vista Downtown Historical Walking and Driving Tour pamphlet. It is a great way to explore the history of this unique town.